Kayla and Inga went off to their new homes on Friday! Inga was adopted by one of our favorite volunteer families, so she is right in Medfield and we know we will be getting frequent updates on her. Kayla moved to NH with a very nice family who understands what a sweet and special girl she is. They don't live far from the ocean, so there should be lots of swimming for her when the weather warms up. Here she is sporting the Comfy Cone she has to wear for a few weeks to keep her from licking at her spay incision. 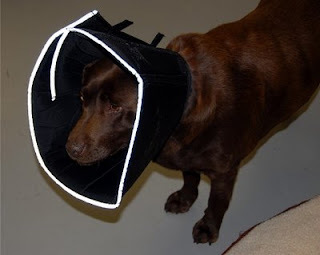 She hated the regular e-collar, but didn't seem to mind the Comfy Cone.